Right after our 1 mile run. So yesterday we had a great day! Simone signed up for a half mile run at school, she trained for a week and Jorge decided he would come and run the mile with her (he is a great dad!) His arrival was a whole ordeal which included his bags not arriving and him not being able to run with Simone. So I had to. I have always loved running despite of me being so lazy to be disciplined about it. After an almost sleepless night we got up and headed for the race. We took a few pictures and off we went. I am so proud she was able to do it, her training paid off so much! I was exhausted and Jorge cheered us on and met at at the last quarter mile and ran with us. Both of us holding Simone's hand, taking her to the finish - a bit of what life is like. 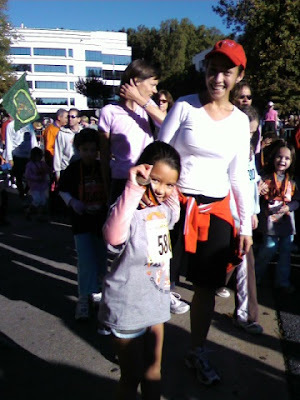 She was really tired but sprinted to the end and the picture is her showing her medal. She is awesome. The morning was beautiful because somehow we felt like a family. We are the two people that cherish Simone the most and we were spending this time with her, celebrating her. I didn't feel alone raising her. We have come to a point were we can share and talk kindly and be glad for each other's achievements. We were all happy. A great big part of me felt ok with things being the way they are and it felt right. We have a built this that we have now, we moved beyond guilt and pain to create a "family" for Simone. Truly life teaches us that blessings come is so many forms and colors, if we just have a little patience and faith.